Born in Budapest, Hungary, in 1964, Gogli attended the High School of Art in Budapest, as well as the School of Wood Sculpting before enrolling as a student in the Obada University. After graduation, Gogli then taught art at the university for three years before moving to Israel in 1995 and attending the Avni School of Art. Today, she lives in Tel-Aviv. 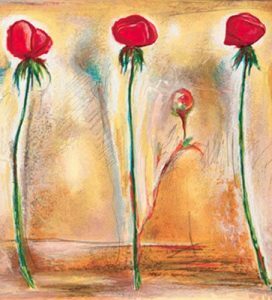 As a child, Gogli loved to paint, beginning at the age of four, and she has been painting ever since. 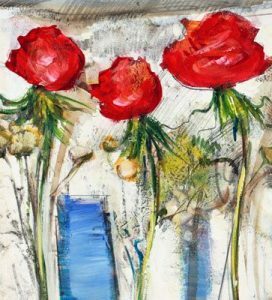 When she came to Israel she says everything changed in terms of her painting. 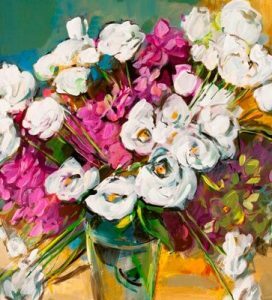 Her imagery became much more abstract and then later on she incorporated the realistic flowers on abstract surfaces for which she is so well known. 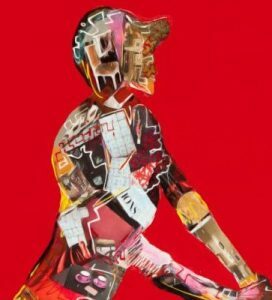 Gogli also has an extensive body of work that evokes a cubist style. The first and most important step she takes in each of her paintings is to create the basis with a palette knife. 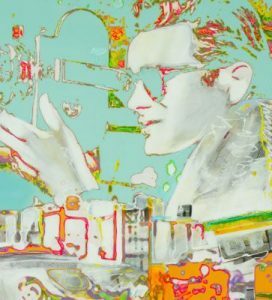 It is the background of the painting, she says, that determines the result. “There are coincidental things that happen in the painting later on that help me complete it with my intuition,” she observes. Gogli is a passionate admirer of beauty and, as such, she loves to visit Haifa’s most striking landmark, the splendid Baha’i Shrine and Gardens. These immaculate Baha’i gardens, with their stone peacocks and delicately manicured cypress trees, are a restful aesthetic memorial to the founders of the Baha’i faith. In one part of the gardens there is a huge domed shrine of the Bab who was the herald of the Baha’i faith. The tomb itself is a spectacular sight, with ornamental gold work and flowers in every nook and cranny. Says Gogli, “When I was in the Baha’i Gardens I suddenly realized that this is a religion that puts beauty in its center in the form of gardens and flowers. And I saw that they are right in the fact that they are looking for beauty—and through the beauty they achieve a kind of perfection. “One solution to holding onto the beauty is to paint it. In paintings it stays with us for a lifetime,” Gogli observes. 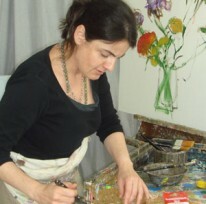 In her quest to perpetuate beauty through art form, Gogli is multi-faceted in that she paints in a realistic style as in her still life originals; and also in an abstract style that features her flowers that have a super-realistic quality; as well as in an abstract style that borders on Cubism where the viewer makes their own interpretation. 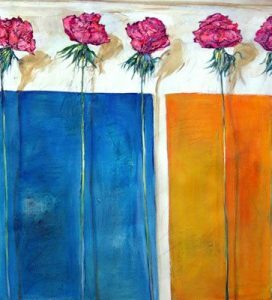 Additionally, her abstract floral imagery depicting three or four red roses or red daisy-like blooms with long, long stems are available as hand-colored etchings. 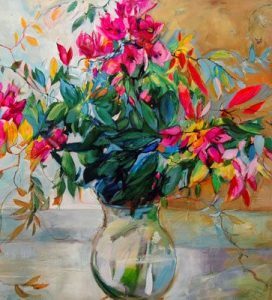 In further discussing the styles of this most versatile artist, the notion of exaggerated or “super” realism comes to mind in that her floral abstract paintings are meticulously detailed in such a way as to create the illusion of textures, surfaces and shadows that appear clearer and more distinct than the viewer might expect. 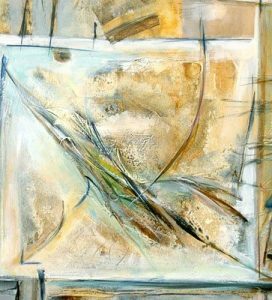 In her Abstract Cubist works, objects are depicted from a multitude of view- points, and surfaces intersect at seemingly random angles, stirring unconscious feelings in the viewer because they are not distracted by realistic images that they relate to. Instead, the viewer is invited to quietly reflect and experience the emotion. 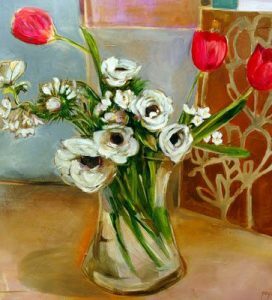 Yet Gogli’s realistic floral still lifes are so natural and gentle and that their scent almost rises from the canvas eliciting a feeling of pure emotion. Gogli, indeed, is true to her word in her pursuit of perpetuating beauty that touches the senses.